Having a Pajama Party? 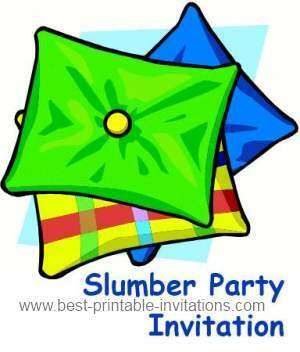 This slumber party invitation is suitable for both girls and boys. Taking a little time to chill out with your friends? 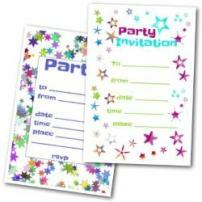 Then you will need a fun and bright invitation card to send to them. Getting an invitation is much more exciting than getting an email! And why not deliver it by hand and visit your friends at the same time. 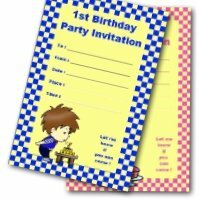 You can print this invite onto colored paper if you like. Why not try out some different colors. Slumber parties are great fun - and a little planning will help your party go more smoothly. 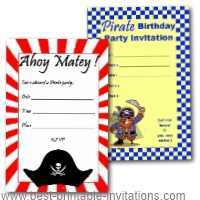 Firstly your invitations! Make sure you send them out well in advance. This will give everyone plenty of notice, and time to make arrangements. 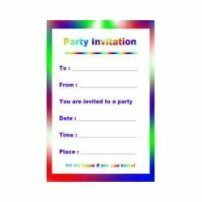 Make a list of who you want to invite before you fill the invites out - be realistic about how many people you can really put up for the night. Often a smaller, cozier get-together is more fun anyway. 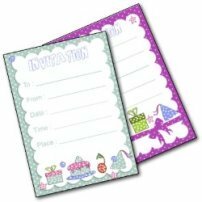 Fill out the cards with all the details that people are going to need to know. Directions to your house? Anything special they need to bring? Do they need their sleeping bags? Or just a toothbrush? It is also helpful to let people know what time the event will be finishing the next day. 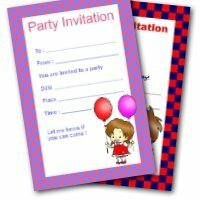 You can use your slumber party invitation to ask for information too. How would you like people to tell you if they are coming - and you might also need to ask if anyone is allergic to anything. What about the night itself? It is helpful to have a few party games ready. Games and activities don't always have to be noisy or boisterous. 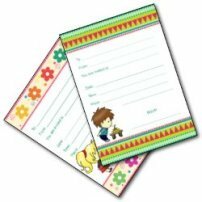 One idea is to provide the children with a notebook and pen to use as a journal. They can ask each other questions and write out the answers - or paint and draw inside it to make a memento of the evening. Providing a box of stickers to use also makes it fun. 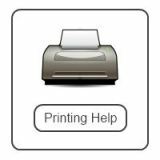 You will also need to think about what supplies you will need. Especially if you want to decorate the room in advance. Balloons are always good - and streamers work well. You may also like to find some strings of pretty lights - they always look very effective when everyone is settling down to sleep. One thing we have done in the past is to make fireflies using this battery experiments idea - and then put them into small jars to make little night-lights. These look lovely scattered around the room. You should also think about other types of entertainment you will make available. You may need to move a computer games console into the sleepover room - or provide music and videos for the guests. Think about what they would like to do - but provide some quieter activities too for when everyone is getting tired. Need some food? Even if they eat before they come, your guests are going to expect some nibbles! Finger foods are great for a sleepover. You can find some recipes on this site. And don't forget to stock up on drinks too. And finally make a quick check of your pajamas! These are often the garments that get a bit worn out (or in the case of children, too small!). So make sure you have something nice to wear!